The Periwinkle Bikepath near Queen Avenue. More than 40 years ago, OSU students had a hand in bringing it about. It was in 1973 that that a group of seniors at Oregon State University had an assignment of designing bikeways for the city of Albany, and the Periwinkle Bikepath was the result. Now another group of students, from the University of Oregon this time, has taken on a similar challenge. It may be too much to expect a similar result. In a letter to the editor of the Albany Democrat-Herald in 2008, Tom Uppstad recalled the Periwinkle work he and his fellow OSU seniors did in the 1970s . “The goal was to provide an alternative route to travel with minimal competition with motor vehicles,” he wrote. And with a couple of exceptions — at Queen and 21st avenues — the 1.7-mile Periwinkle bike route manages to do so, even though it falls short of the original goal, which was to run from South Albany all the way to the Willamette River. Now, U of O students are taking a look at another waterway, the Santiam Canal as it flows through Albany. They are taking a course titled “Topics in Bicycle Transportation” taught by Marc Schlossberg, professor of planning and co-director of the university’s Sustainable Cities Initiative. As part of that initiative, several classes and faculty members have been studying Albany issues identified for them by the city staff. A tall order, that. Especially considering those “constraints,” which include long-standing objections to any recreational development along the path from Public Works and, probably, property owners along the way. 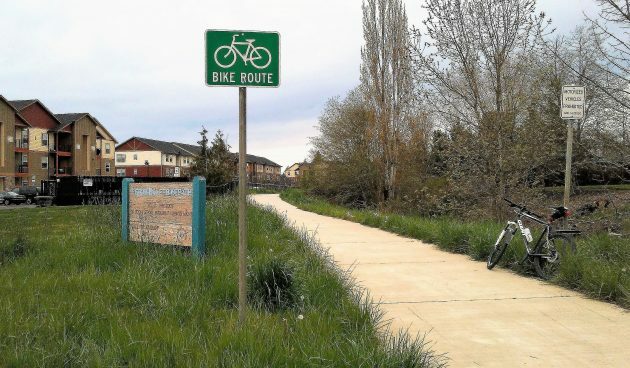 The Town Center Plan that emerged from the Central Albany Land Use and Transportation Study in the 1990s recommended that walking paths be developed along the Santiam Canal, but it has not been done. And as a bikeway such a path would be impractical because cyclists would have to stop for cross streets on every block. Heaven forbid that bicyclists would actually have to obey traffic laws. You could say the same thing about motor vehicles. If they stayed in their lane, the paint stripe wouldn’t have to be replaced on a regular basis. Bikes also don’t obliterate the lines — or damage the roads in any other way. The bike lanes are there on gas tax roads for the exclusive use of bikes, cars can not use them, but cars and trucks paid for them, bikes didn’t. Because something was paid for with SDCs, then I should be able to use that with my quad…………. right??? Let’s face it, we will just have to agree to disagree here.. There is no such thing as a “gas tax road.” Our road system was built and is being administered and maintained — to a greater or lesser degree — with revenue from various sources including the fuel tax, other fees, the property tax, development charges, and in the case of the federal highway fund, the income tax and government borrowing to supplement the federal fuel tax. So we all pay in one way or another for the whole system. Maybe we can agree at least on that. Having a city council member complain about wasting tax money is beyond ludicrous! Look up how much the Feds subsidize each ride on the Albany Transit System. You should be thrilled how much we save you every time we use the bike instead of the bus. Since the bus is running anyway, your riding a bike saves absolutely nothing. Bill, name a city councilor who has spoken out against spending more than I have. Just because you aren’t the worst doesn’t make you “good”. There’s not a lot of competition with your “group” to be the “frugal one”.